Like anything in the cosmetic industry, there are different views on what is safe and what we should do. Whatever decision we make about our own body is our own, we just need to make sure we do it safely and smartly! 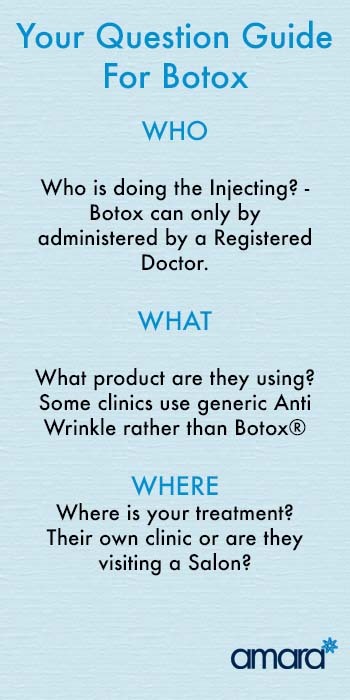 Here’s our guide to what questions to ask before your first Botox Treatment or when looking for a new clinic! It is very important to know that only a registered doctor or dentist is legally allowed to administer Botox®. Botox® is a prescription only neurotoxin and cannot be bought or injected by anyone else. Doctors are experts in facial anatomy and will know where and where not to inject on the muscles of the face, a better understanding of anatomy will also give them a better understanding of what muscles should be injected to get the most benefit of a lift. What Experience Do they Have With Botox®? 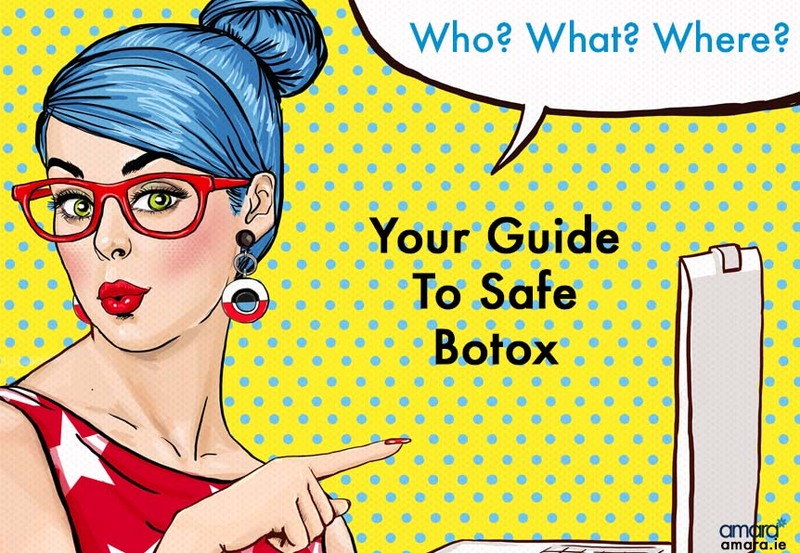 Even though doctors are allowed inject Botox injectable experience is still essential. A separate injectable course is required to understand the injecting of Botox as well as the toxin. Most doctors will develop their own injection techniques depending on the product they are using. How long a doctor has been injecting will affect where they inject, how quick they are and how painful your treatment is. One of the most important questions to ask when going for a Botox treatment is do they use Botox? This may be confusing to you! Botox – the original toxin from Allergan is made in Westport and is the only place in the world where Botox is made! Allergan® are putting continuous research and trials into their product constantly requesting new studies for new uses for Botox. Botox® by Allergan® is the original Botox® brand that you have heard about! Only made in Ireland this is then shipped across the world. Botox lasts on average 3-4 months and kicks in fully by 2 weeks. Like dermal filler, there are other forms of anti-wrinkle injection from other brands such as Dysport or Azzalure. Other brands may not last as long as Botox but may kick in quicker. Be sure to ask exactly what product they are using before your treatment, if your doctor or the clinic is unwilling to confirm that it is actual Botox® then it likely isn’t. Typically price differences in different clinics are down to cheaper products and less skilled injectors. Where exactly is your doctor based? Are they in their own clinic or do they travel from place to place? Typically in beauty salons or laser clinics, a visiting doctor would perform treatments once a month, typically they would be cheaper than in a full-time clinic or in their own premises. Usually if settled in their own clinic then reviews would be offered as well as top ups. Being in one place also makes it easier to get in touch with your doctor if any issues were to arise (not likely). Where do they want to inject? If you are thinking about a Botox treatment or you want to learn what treatments would be best for you, contact us now for more information.